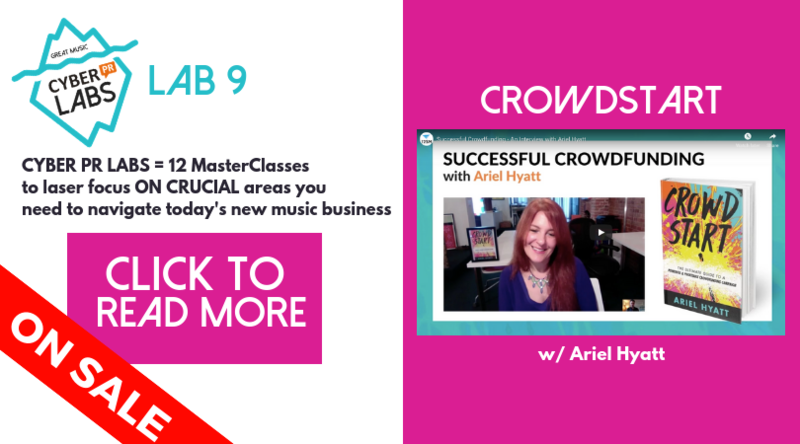 CROWDSTART Ariel’s Best Selling Book is now a MASTERCLASS! In LAB 9 I’ll walk you through all the steps you need to prepare, launch and succeed at a crowdfunding campaign. The game changer that allowed me to profoundly change the course of my business my crowdfunding campaign which raised over $60,000. I already had a successful business, but it was the extra cash that helped me put strategies into place and create products that made a massive impact. In this LAB I will break down everything you need to know to succeed with a crowdfunding campaign. I culled EVERYTHING I’ve learned about running my successful crowdfunding campaign and coaching others do the same into my book, CROWDSTART, which hit #1 on three Amazon bestseller lists – Music, Entrepreneurship and Investing. And NOW I am turning the highlights into a LAB. I will show you examples of campaigns that worked and we will hear from some artists who have completed successful campaigns about what to focus on and what to avoid. We’re having a FLASH SALE! From now until Monday, LAB 9 is only $39! Click the image below to reserve your spot.